The Hunger Games: Mockingjay screenwriter returns to genre with S.T.A.G.S. Peter Craig, who wrote the screenplay for both parts of The Hunger Games: Mockingjay, will return to young adult/teen violence by adapting S.T.A.G.S., the YA novel from M.A. Bennett released this past week. The Hunger Games: Mockingjay Part 2 opens in theaters November 20th. “Welcome to the 76th Hunger Games…” – and it’s taking place right in the Capitol! The Hunger Games: Mockingjay, Part 2 begins November 20th, with tickets on sale now! Here is the official trailer for The Hunger Games: Mockingjay Part 2 that debuted at SDCC – it was just released this morning and is already closing on 1.5 million views! The Hunger Games: Mockingjay Part 2 stars Jennifer Lawrence, Josh Hutcherson, Liam Hemsworth, Woody Harrelson, Donald Sutherland, Julianne Moore, Philip Seymour Hoffman, Sam Claflin, Elizabeth Banks, Jena Malone, Jeffrey Wright, and Stanley Tucci. It is directed by Francis Lawrence. 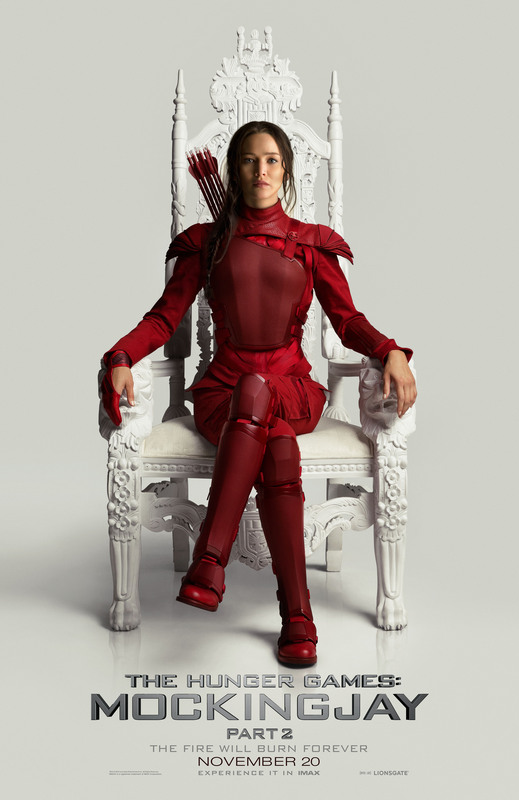 Lionsgate today unveiled plans to debut the year’s most anticipated film, The Hunger Games: Mockingjay – Part 1, in the UK, Asia and North America. The film, the third in the global blockbuster Hunger Games film franchise, opens in theaters worldwide on November 21, 2014 and will hold its world premiere in London, England on November 10th. Beginning in Beijing, the cast including Academy Award®-winner Jennifer Lawrence, Josh Hutcherson, Liam Hemsworth, Sam Claflin, director Francis Lawrence and producers Nina Jacobson and Jon Kilik, will embark on a World Press Tour with stops in Seoul, London, New York and Los Angeles. Elizabeth Banks, Julianne Moore, Natalie Dormer, Stanley Tucci and Donald Sutherland will join the delegation in London for the film’s UK world premiere in Leicester Square. Fans in the U.S. who purchase tickets on Fandango October 29th during the first 24 hours of advance sales will be entered for a chance to win a trip to the London Premiere. All purchases on AMCTheaters.com, Cinemark.com, Fandango.com, and MovieTickets.com in the first 24 hours will receive a free download of The Hunger Games: Catching Fire on VUDU. All of the cast will reconvene for the Los Angeles premiere, which will take place on November 17th at the Nokia Live Theater. The first Hunger Games film generated nearly $700 million at the worldwide box office. The second film in the franchise, The Hunger Games: Catching Fire, was the #1 domestic film of 2013 and the 10th highest-grossing North American release of all time, grossing over $860 million around the world and bringing the combined global box office of the first two films to over $1.5 billion. The worldwide phenomenon of The Hunger Games continues to set the world on fire with The Hunger Games: Mockingjay – Part 1, which finds Katniss Everdeen (Jennifer Lawrence) in District 13 after she literally shatters the games forever. Under the leadership of President Coin (Julianne Moore) and the advice of her trusted friends, Katniss spreads her wings as she fights to save Peeta (Josh Hutcherson) and a nation moved by her courage. The Hunger Games: Mockingjay – Part 1 is directed by Francis Lawrence from a screenplay by Peter Craig and Danny Strong, from an adaptation by Suzanne Collins and produced by Nina Jacobson’s Color Force in tandem with producer Jon Kilik. The novel on which the film is based is the third in a trilogy written by Suzanne Collins that has over 65 million copies in print in the U.S. alone.